The summer vacation break is coming up soon over here and I'll be gone for almost one whole month (sorry folks!). Right now, I'm holding a contest, searching for all (potential) guest authors out there that want to share one (or more) articles with the world by placing them on Marcofolio.net. I'll personally review all submitted articles myself and will send a notification when the article is approved. 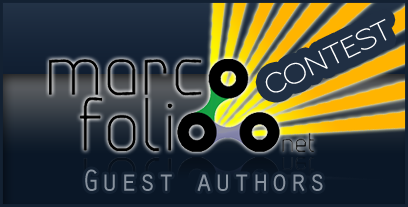 Your article is placed on the front page of Marcofolio.net in this summer (July or August). What would a contest be without any prizes to win? Of source, all articles will have a link to your own website, together with a short biography of yourself. You'd be promoting your own website too! So what are you waiting for? Start writing an unique article for Marcofolio.net that'll maybe get placed this summer. Be fast, submitting articles ends at 30th of June. There are a couple of rules you must read and follow before entering the contest. The article has to be completely unique and will only be used on Marcofolio.net. Don't copy articles from other websites or place them on your own. When you're not sure if your article fits in the niche, please contact me to ask it before writing the article. The article has to be written in proper English. When you don't have your own website and you win the 1st prize, you can choose to trade it into $50.00 (fifty) USD on your PayPal account. When you don't have your own website and you win the 3rd prize, you can choose to trade it into $10.00 (ten) USD on your PayPal account. Multiple entries for each author is accepted, but you can only win one prize. Submitting articles ends at 30th of June. Articles that are send in later will not enter the contest. Guest articles is a great way to get your own blog noticed online. You'll be able to create a trackback to your own website and many visitors around the world visiting Marcofolio.net will see it too. Simply send an email with your article, website URL, short bio and possibly a picture to contact[at]marcofolio.net (make sure to replace "[at]" with "@"). I'll review your article and will get back to you as soon as possible. Give everything you have when writing a guest article. Not only winning the 1st prize is pretty nice, thousands of visitors will read your article and follow to your website. I really hope for some nice guest articles, enjoy writing them!